Zheng, X. and Pincus, D. (2017). Serial Immunoprecipitation of 3xFLAG/V5-tagged Yeast Proteins to Identify Specific Interactions with Chaperone Proteins. Bio-protocol 7(12): e2348. DOI: 10.21769/BioProtoc.2348. Zheng, X., Krakowiak, J., Patel, N., Beyzavi, A., Ezike, J., Khalil, A. S. and Pincus, D. (2016). Dynamic control of Hsf1 during heat shock by a chaperone switch and phosphorylation. Elife 5. This method was generated to isolate high affinity protein complexes from yeast lysate by performing serial affinity purification of doubly tagged 3xFLAG/V5 proteins. First, the bait protein of interest is immunoprecipitated by anti-FLAG-conjugated magnetic beads and gently eluted by 3xFLAG antigen peptide. Next, the bait protein is recaptured from the first eluate by anti-V5-conjugated magnetic beads and eluted with ionic detergent. In this manner, the majority of abundant, nonspecific proteins remain either bound to the first beads or in the first eluate, allowing pure, high affinity complexes to be obtained. This approach can be used to show specific interactions with notoriously ‘sticky’ chaperone proteins. Immunoprecipitation followed by mass spectrometry (IP/MS) is an unbiased method to identify protein-protein interactions with a specific bait protein of interest. While this approach has been fruitfully applied to identify protein interaction networks, it is plagued by false positives–proteins that appear to interact but are actually non-specifically bound to the beads or antibodies used in the affinity purification. In particular, highly abundant proteins such as ribosomal proteins, metabolic enzymes and chaperone proteins are common contaminants. However, sometimes these common contaminants may be bona fide interaction partners, yet it is challenging to demonstrate specificity. To overcome this obstacle, we developed a serial affinity purification approach to isolate specific, high affinity complexes between bait proteins of interest tagged with two affinity epitopes–the 3xFLAG and V5 tags (Figure 1). We have generated a plasmid containing the 3xFLAG-V5 epitopes and a HIS3 selectable marker that can be amplified and used to C-terminally tag any yeast protein of interest in a single yeast transformation (Zheng et al., 2016). We originally applied our method to demonstrate a specific interaction between the heat shock transcription factor (Hsf1) and the major Hsp70 chaperone proteins present in the yeast cytosol, Ssa1/2. However, this approach can be generally applied to identify high affinity complexes involving a protein of interest. While this technique removes the bulk of false positive interactions, a major caveat is that low affinity and transient interactions are likely to be lost. Figure 1. Schematic overview of the protocol. A 3xFLAG/V5 dual-tagged bait protein is serially purified with anti-FLAG beads followed by anti-V5 beads. Inoculate the yeast strain harboring Hsf1-FLAG-V5 in a culture tube containing 3 ml YPD liquid media (see Recipes) and grow overnight at 30 °C in a shaker set at 200 rpm. Dilute 2 ml overnight grown culture into the 500 ml flask containing 100 ml YPD media, and grow to OD600 = 0.5-0.8 OD at 30 °C in a shaker set at 200 rpm (~4 h). Pour the growth media into two 50 ml Falcon tubes, and centrifuge at 4,000 x g for 4 min. Discard the media and submerge the Falcon tubes containing the yeast pellets in liquid nitrogen. The pellets can be stored at -80 °C for up to 3 months. Add dry ice pellets into a cryogenic tissue grinder pre-chilled at 4 °C (a simple coffee grinder will work as well) and grind it into powder that covers the blades. The dry ice allows the cells to be lysed while remaining frozen. Dry ice should be handled with care and never confined in an airtight compartment. Add the yeast pellets to the crushed dry ice and grind the yeast pellet with the dry ice for 30 sec. Repeat the grinding 5 more times for a total of 6 grindings. Add more dry ice pellets as needed to keep the blades fully covered with dry ice. Transfer the pulverized cells/dry ice powder into beaker, and sublimate/evaporate dry ice at room temperature. Add 1 ml lysis buffer and incubate the lysate at 4 °C for 5 min with intermittent swirling to resuspend. Transfer the lysate into a 1.5 ml centrifuge tube, and centrifuge at 20,000 x g for 10 min. Reserve the supernatant (cleared lysate). Take a 10 µl sample of the cleared lysate for analysis by Western blot (input sample). Add 25 µl anti-FLAG magnetic beads to a 1.5 ml tube. Place the tube on a magnetic separation rack and remove the buffer. Wash with 200 µl lysis buffer (see Recipes) on the magnetic rack and discard the wash.
Pipet the cleared lysate into the 1.5 ml tube containing the anti-FLAG beads and incubate at 4 °C for 2 h on an inversion rotating mixer. Place the tube on the magnetic separation rack. When the solution clears (~2 min), take a 10 µl sample for analysis by Western blot (unbound sample). Discard the unbound fraction and wash the beads 3 times with 500 µl lysis buffer. Gently vortex the beads with each wash step and incubate on ice for 5 min. Return to the magnetic separation rack and discard washes. Elute the Hsf1-FLAG-V5 complex with 500 µl lysis buffer containing 100 µg/ml 3xFLAG peptide. Incubate on ice for 30 min. Repeat for a total of 2 elutions, and pool the eluate fractions. Add 25 µl anti-V5 magnetic beads to a 1.5 ml tube. Place the tube on a magnetic separation rack and remove the buffer. Wash with 200 µl lysis buffer on the magnetic rack and discard the wash.
Pipet the pooled 3xFLAG eluate into the tube with the V5 beads and incubate at 4 °C for 2 h on an inversion rotating mixer. Place the tube on the magnetic separation rack. Discard the unbound fraction and wash the beads 3 times with 500 µl lysis buffer. Vortex the beads at half-maximal setting for 5 sec with each wash step and incubate on ice for 5 min. Return to the magnetic separation rack and discard washes. Add 100 µl lysis buffer + 2% SDS. Incubate for 15 min at 95 °C. Place tube on the magnetic separation rack and reserve solution. Use 10 µl for analysis by Western blot (final eluate: this is 10x concentrated compared to input and unbound fraction). 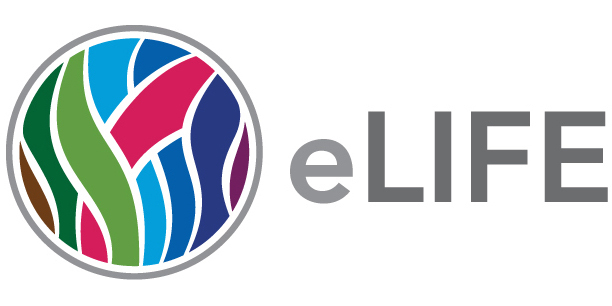 Submit remaining 90 µl samples to a mass spectrometry core facility (e.g., Whitehead Institute Proteomics Facility) for analysis as described (Zheng et al., 2016). Mass spectrometry is extremely sensitive to contamination by proteases, so wearing gloves, working quickly and keeping samples on ice prior to analysis is of paramount importance. Mass spectrometry data should be analyzed by first ensuring that you observed your bait protein with reasonable coverage (> 25%). Putative interacting proteins should be validated by repeated experiments and alternative detection methods, such as Western blotting (Figure 2). For examples of peptide counts of a bait protein, binding partners and nonspecific contaminants, see Figure 1–source data 1 in Zheng et al., 2016. Figure 2. Western blot of immuno-precipitated Hsf1-3xFLAG/V5. 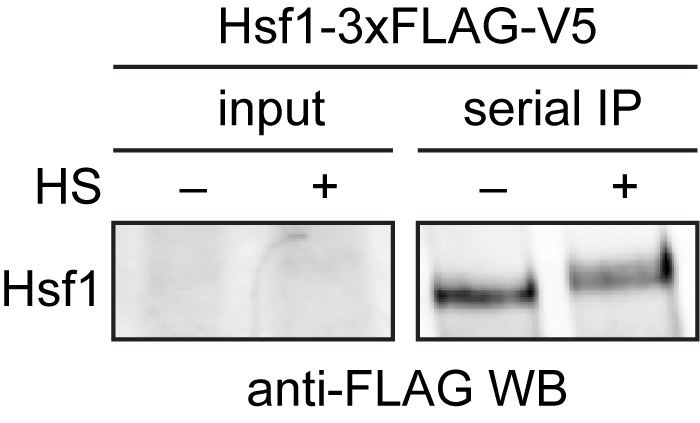 3xFLAG/V5-tagged Hsf1 was serially purified with anti-FLAG and anti-V5 beads from cells under control (-) and heat shock conditions (+). Hsf1 is low abundance and cannot be easily detected in the input, but is enriched following immunoprecipitation. Hsf1 migrates slower in the gel under heat shock conditions due to phosphorylation (HS = heat shock). Despite the stringency of the serial affinity protocol, background contaminants will still be observed in the mass spectrometry data. In general, the repertoire of highly abundant ribosomal proteins and metabolic enzymes that are nonspecific contaminants is not very reproducible, though a subset is always present. Thus, with enough replicates, most of these contaminants can be discarded. This protocol was adapted from our previous work (Zheng et al., 2016). This work was supported by a grant from the Office of the Director of the National Institutes of Health to D.P. (DP5 OD017941-01). Copyright Zheng and Pincus. This article is distributed under the terms of the Creative Commons Attribution License (CC BY 4.0).